SPJ DePaul was named National Campus Chapter of the Year for the second time in three years on Aug. 25 at the Excellence in Journalism Conference in Anaheim, Calif. The DePaul chapter, founded in 2010 in DePaul’s College of Communication, also was named the Region 5 (Illinois, Indiana and Kentucky) Chapter of the Year. “These honors are a great testament to our chapter’s hard work, particularly the leadership of our executive board,” said SPJ DePaul adviser Mike Reilley. “Winning National Chapter of the Year once is a great feat. Twice is a reflection of our students’ consistently strong work in the field of journalism. Judges cited the chapter’s innovative and well-attended events and programming, use of digital technologies and its increased membership. At 73 members, SPJ DePaul is one of the largest student chapters in the nation. 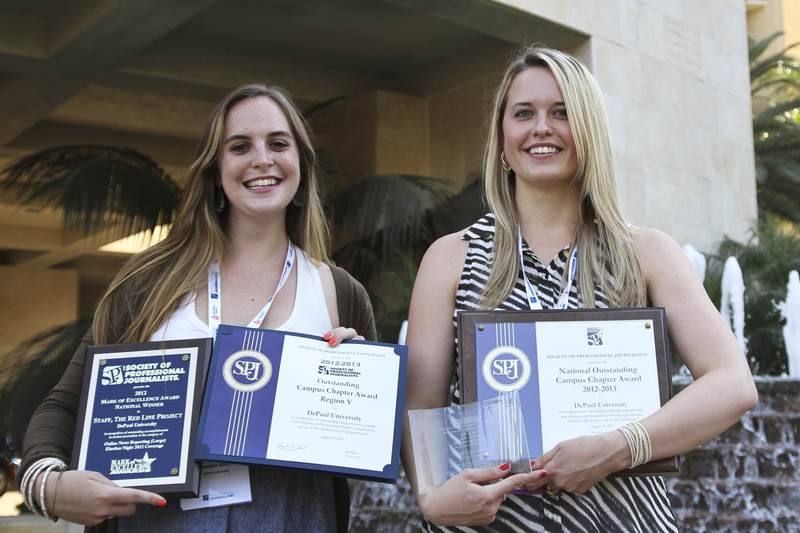 SPJ DePaul competed with 11 other regional winners for the national award.